Satsuki Odamura is a koto virtuoso who moved to Australia in 1988 after gaining her Shihan (master license) from koto legends Tadao and Kazue Sawai. In 2002 she formed The Sydney Koto Ensemble, which has been performing in venues throughout the country, playing both the standard 13-string koto and the 17-string bass koto. 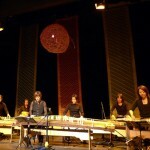 The ensemble&apos;s contemporary repertoire explores the depth and breadth of the koto&apos;s sound.